Well done to Rob from Cardiff who is the winner of the last DIY Doctor Competition. Rob wins a Porsadrill Diamond Drill Set kindly donated by 365 Drills. This is winging its way to him, and if he wants to share pictures of him using them we would be happy to share them with you. Porsadrill makes drilling into ceramic and porcelain tiles a doddle with their innovative drilling guide and their super sharp diamond tipped drill bits. See our project on Porcelain Tiles for more information. If you are disappointed in not winning this great drill set you can get free delivery on the Porsadrill set by entering the Voucher Code DIYDOCTOR in the box at checkout. The DIY Doctor Summer Competition is sponsored by ABD Tools who are a UK company that specialises in solving DIY and Building problems that they have noticed and brainstormed to create a solution. 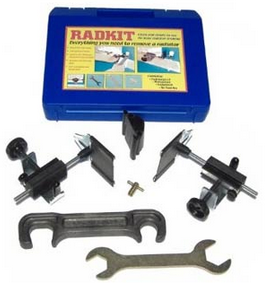 The first prize is a RadKit Pro set which will allow you to easily remove a radiator without mess or fuss. See our DIY Project on removing a radiator to decorate which includes a video tutorial on how to use Radkit. The RadKit Pro includes all the tools you need to remove and replace or fit a new domestic central heating radiator without draining down the system. The case is designed to store the tools safely so you don’t lose the components and so it’s ready whenever decorating or radiator work needs to be done. The kit has been designed to help minimise the risk of damage to pipe work, woodwork, and painted surfaces and to avoid staining to carpets and household contents providing the simple instructions are followed. Professionals and DIY Home Improverers can use the RadKit to replace a radiator with increased confidence of complete success. The kit also includes a set of instructions and handy hints for using your Radkit successfully. Answer this simple Question for a chance to win: In plumbing, what is a TRV? The Competition is open for entries until 13th October 2014, all you need to do is answer a simple question and send in your details, the lucky winner will be drawn at random from the correct answers after that date. There are also runner up prizes of the Easy Tapsplitter kit, also produced by ABD Tools. The Tapsplitter is a really handy gadget for removing the heads from stuck taps without “spanner slip”, bruised knuckles and broken basins. See our Tapsplitter product review on YouTube.